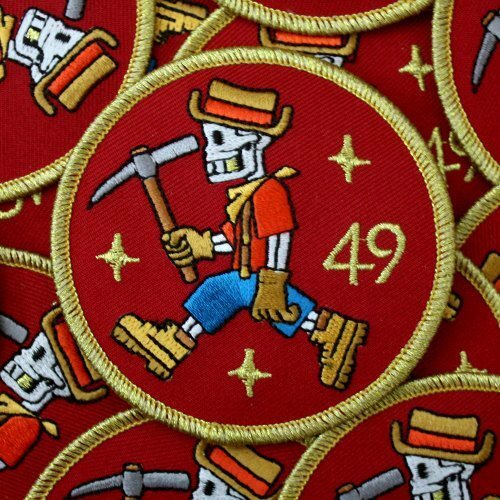 Artist Dennis Brown has his work printed onto T-shirts, patches, and badges! Artist Dennis Brown doesn’t just sell his hugely popular work on paper or canvas. Instead, he’s had his art printed on patches, fanzines, badges, and T-shirts as a way of making his work even more accessible to fans. Dennis Brown likes to work in lots of different styles and has his art printed onto a wide range of merchandise, including self-published books and zines, posters, T-shirts, patches, badges, and original art screen prints. Most recently, he had a stall at the Alternative Press Expo (APE) Convention in San Jose, California – an event which showcases the work of independent artists and creatives. So how does he find time to make all this stuff? And how does he deal with any printing problems along the way? He says: “I’d already made a lot of these products in the past, so thankfully there weren’t too many issues! I usually start with a set gameplan, and then adjust to changes and try and figure out the best solutions to any problems. “There can also be issues with the silk-screen process for printing T-shirts, and you might find some colors get slightly offset due to different temperatures in the printing process. So what attracted Dennis Brown to having his work printed on different merchandise? He says: “Growing up in the 80s, I was always really into consumer-based goods, such as Transformers, Teenage Mutant Ninja Turtles, and even Hello Kitty (he lived in Japan as a child). “I was fascinated by how you could reproduce your art onto so many different things, so when I saw my first photocopy machine, the first thing I wanted to do was make my own comics and give them to my friends! Dennis Brown learned all about the silk-screen printing process in high school, and learned how to make his own T-shirts from scratch. In his senior year, he made shirts to sell to his friends and also self-published his first book. He says: “It’s much easier these days, and you can literally get anything made – it’s just a matter of putting the research in! So how can you get started yourself? Dennis says: “You can buy a silk-screen printing starter kit at Blick or Michaels which has everything you need to get started. You can also look up ‘how to’ videos on YouTube. Be prepared to go through the trial and error stage to see what’s possible and what’s not. “Now, I’m at the stage where I’ve worked out all the trial and error and am used to preparing my work for print. I usually works with a local printer who I trust to do a good job. It’s always cheaper and usually better if you buy your own materials (such as paper, T-shirts etc), and take it to them. “How do you find a good printer? Ask other artists which ones they use. It’s amazing how helpful other creatives are – especially those who make their own products. You’ll probably find they’re more than happy to share info about which materials and printers they use. I’ve always found the convention community is usually super-supportive of other artists. Over the past couple of years, Dennis Brown has seen his social media following grow enormously – along with demand for his products. He says: “I’m definitely seeing a trend over the past few years and my patches seem to be everywhere! Sometimes, you just need to start something. I now have a collector of my work in New Zealand, who saw my work on Instagram. So how do get started with making and selling your own art merchandise? Dennis says: “When making own T-shirts, study the market, and ask yourself which category your designs fit into. Take a look at what’s already been done, and what hasn’t been done. Take a look at the pricing and quality of other T-shirts, and look out for what’s trending. “The upshot of going to your local printers is that you can see examples of their work and discuss practicalities with them. You can see the actual quality of their printing and materials and work out what’s possible with your art.